We reengineered the underside of the age-old bike saddle into a comfortable shoulder pad. Whether you’re rushing down to the metro, or hauling your ride to the third floor, the Porter+ is an easy way to carry your bike. 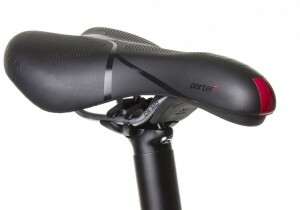 The Porter+ works with all Tern bikes and any bike with at least 20 cm of clearance between the saddle and top tube.